Lupin species were present in Western Australia as early as the 1850s. They initially spread on uncultivated land and were thought to have little value. People soon noticed their ability to grow vigorously on poor sandy soils, and how much better other crops grew on land that had previously grown lupin. In the early 1900s, the newly established Journal of Agriculture published several articles advocating the use of lupin as green manure. Trials evaluating lupin as green manure crops were set up at the Narrogin, Chapman and Nangeenan state farms in the first decade of the 20th century, but the results seem to have been lost and there is little evidence that the practice became widespread. At about the same time, the value of the sandplain lupin as a sheep feed was recognised at Geraldton and it was extensively planted there after 1910, and at Gingin and Dandaragan from about 1920. Lupin was incorporated in rotation trials at the new light land research station at Wongan Hills in the 1920s. Interest in sandplain lupin waned in the 1930s and 1940s when increasing emphasis was given to subterranean clover as a basis for Western Australian farming systems. Dr John Gladstones began his long association with lupin research at the University of Western Australia in 1954. The Deputy Director of the Institute of Agriculture at the time, Andrew Stewart, was convinced that lupin had great potential in Western Australia, and persuaded Dr Gladstones to make them the subject of his Bachelor of Science in Agriculture (BScAgric) honours thesis. This work expanded into a PhD project and later into the lupin breeding program that made possible modern lupin-based cropping systems in Western Australia. While this work at the University of Western Australia (which eventually concentrated mainly on narrow-leafed lupin) was in its early stages, sandplain lupin was playing an important role in the post-war agricultural expansion of Western Australia. Eric (later Sir Eric) Smart developed a large tract of land at Mingenew in the 1950s using a system which relied on sandplain lupin as summer feed for sheep and to build up soil fertility for cereal cropping. This demonstrated the capacity to transform otherwise unproductive soils with lupin and was widely copied by other farmers, thanks in no small part to the large field days Sir Eric hosted on his farm and research trials conducted there by scientists from the University of Western Australia and the Department of Agriculture. This system was the forerunner of the modern wheat:lupin cropping system. Lupin species belong to the genus Lupinus, which is large and diverse. The genus is divided into two main groups: the new world species which occur naturally in the Americas, and the old world species which occur naturally in the countries bordering the Mediterranean Sea and in eastern Africa. There are more than 100 new world lupin species. However, only one of these, pearl lupin (Lupinus mutabilis), currently has potential as a crop species in Western Australia. Traditional farmers in Andean regions have grown pearl lupin for many centuries. There are 12 old world lupin species. All modern lupin cultivars used in crop production have been developed from this group. Old world lupin species have been used in traditional agriculture in the Mediterranean region for thousands of years. These traditional lupin species, however, are semi-domesticated at best. There are three main differences between wild and domesticated lupin. All wild lupin have bitter alkaloids in the seeds which make them unpalatable and sometimes toxic to livestock. Their hard seed does not readily imbibe water, so that some seed survives in the soil for several seasons before germinating; and their shattering pods scatter seed on the ground at maturity. Domesticated lupin species have sweet (low alkaloid) seed that can be fed to livestock or eaten by people; soft seed that will germinate as soon as it is sown into moist soil; and non-shattering pods that retain seed on the plant until it is harvested. Fully domesticated lupin crops were not developed in Europe or Australia until the 20th century. Also known as Australian sweet lupin, narrow-leafed lupin (Lupinus angustifolius) is by far the most important lupin species in Western Australia, comprising over 95% of all lupin grain production. The first fully domesticated cultivar of narrow-leafed lupin, Uniwhite, was released in Western Australia in 1967. It was named for its white flower which Dr Gladstones incorporated to distinguish it from the blue-flowered, bitter narrow-leafed lupin then used for green manuring. It matured too late to perform well in most wheatbelt areas, so lupin cropping did not begin to expand in the areas we now associate with lupin until the release of the early flowering Unicrop in 1973. Initial cultivar development concentrated on earlier flowering and resistance to grey leaf spot disease which threatened the industry in the 1970s. Subsequent breeding at the Department of Agriculture and Food, Western Australia (DAFWA) has aimed at improving adaptation, yield potential and resistance to other diseases. Cultivars with resistance to phomopsis, which causes lupinosis in grazing animals, and anthracnose (first released in 1988 and 1996 respectively), were important breeding milestones. Also known as the European white lupin, albus lupin (Lupinus albus) is the major lupin species grown in Europe. Fully domesticated cultivars of albus lupin were first developed in Germany in the 1930s. Albus lupin is only a minor crop in Western Australia. Almost 40 000 hectares of the Russian cultivar Kiev Mutant were grown annually in the northern wheatbelt during the 1990s, but this disappeared when lupin anthracnose was identified in Western Australia in 1996. Andromeda is the first anthracnose-resistant albus lupin cultivar and was released in 2005 by DAFWA. It has only moderate anthracnose resistance and flowers later than Kiev Mutant. Yellow lupin (Lupinus luteus) was the first lupin species to be fully domesticated. The first cultivars were released in Germany in the 1930s. It has been extensively grown in northern and eastern Europe. The German variety Weiko III was released in WA in 1959, but it never became firmly established. 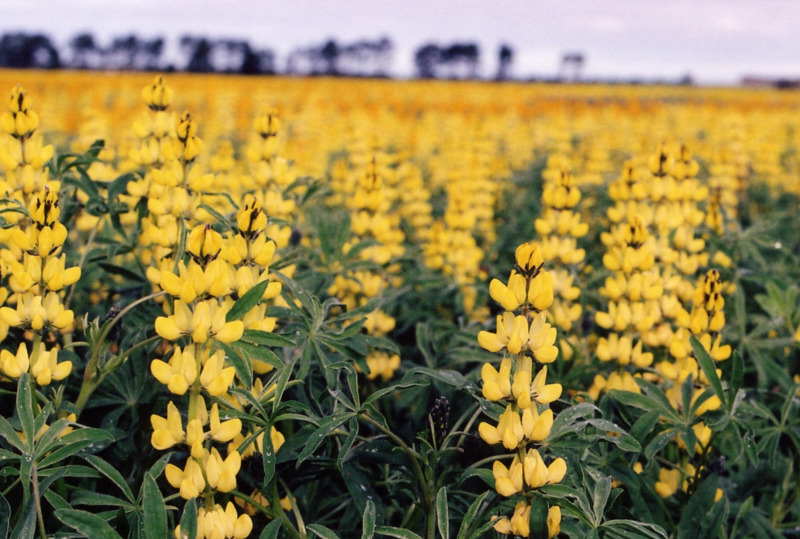 Local interest in yellow lupin was renewed in the 1990s when DAFWA researchers noticed its high level of resistance to brown spot, pleiochaeta root rot and Eradu patch and its tolerance of very acid soils. In 1997 DAFWA released the cultivar Wodjil, which had been selected from a Polish cultivar. Wodjil was very susceptible to anthracnose and to aphid feeding damage and further work led to DAFWA releasing Pootallong in 2005. Yellow lupin is also the most frost susceptible grain lupin species. Yellow lupin grain has a higher protein content and better amino acid balance than narrow-leafed lupin grain and is therefore more valuable as poultry, pig and aquaculture feed. Also known as WA blue lupin, sandplain lupin (Lupinus cosentinii) is unlike the other species so far discussed in that it retains the wild characters of bitter seed, hard-seededness and shattering pods. It is not used for grain production, but for summer grazing (although its seed is bitter, it belongs to a group of roughseeded lupins with lower seed alkaloid levels than other wild lupins) and soil improvement. Sandplain lupin is well adapted to the sandy soils of the northern wheatbelt, and it will thrive on soils too poor even for narrow-leafed lupin. DAFWA, formerly known as the Department of Agriculture, released the cultivar Erregulla in 1976. This had white flowers and sweet seed and did not shatter but it was not widely adopted. Another line of sandplain lupin was developed which also had soft seed, but this was not released. There are 400 000-750 000 hectares of self-regenerating sandplain lupin in Western Australia. Some farmers still value sandplain lupin but many others now regard it as a weed. There are two reasons for this. First, sandplain lupin emerges as a weed in grain lupin crops because the hard seeds can persist in the soil over several cropping cycles. As well as competing with grain lupin, sandplain lupin seeds are an undesirable contaminant in narrow-leafed lupin grain. There are no herbicides that will selectively control sandplain lupin in crops of other lupin species. Second, sandplain lupin is very susceptible to anthracnose which it harbours and spreads to other lupin species growing nearby.